“Extreme Makeover: Home Edition,” the Emmy Award-winning reality show on ABC Television, visited the Fargo (N.D.)-Moorhead (Minn.) area in October to help a family in need. Bill and Adair Grommesch manage HOPE Inc., a year-round program that helps children and young adults with disabilities. Their son, Garrett, who was born with spina bifida, inspired them to manage HOPE Inc., which makes sports like hockey, ice skating and soccer accessible to everyone. Ironically, the Grommesch’s home wasn’t handicap-accessible, even though both their son and daughter have disabilities. 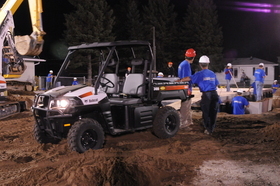 Bobcat Company and the local dealer, Bobcat of Fargo, helped crews build them a brand-new handicap-accessible home by donating the use of more than 20 machines. “The roots of Bobcat Company are in Fargo and our company’s dreams came true in this town. It’s the least we could do to help our neighbors’ dreams come true, too,” said Chris Shea, Bobcat of Fargo. More than 200 organizations donated their services to help move the Grommesch’s existing home to another family and build them an entirely new home on the corner of 8th Street and 22nd Avenue in South Moorhead.